20 Days Left to Find Buying Opportunities In Gold - Technical Traders Ltd. - Investment Strategies, Analysis & Intelligence for Seasoned Investors. Our researchers have been glued to Gold, Silver and the Precious Metals sector for many months. 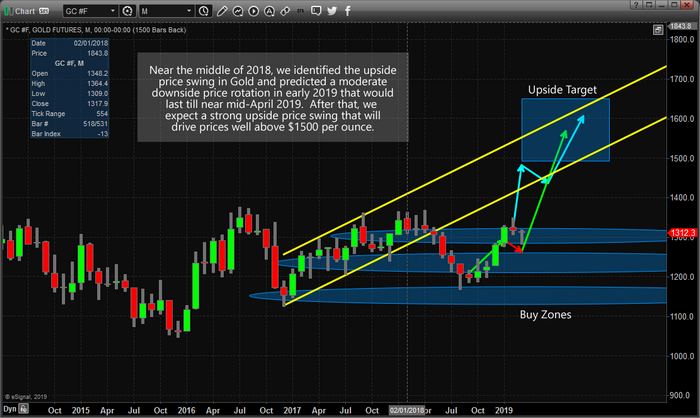 We believe the current setup in Gold is a once-in-a-lifetime opportunity for skilled traders to stake positions below $1300 before a potentially incredible upside price move. We've been alerting our members and follower to this opportunity since well before the October/December 2018 downside price rotation in the US markets. Additionally, our researchers called the bottom in the US equities markets and warned of an incredible upside price rotation setting up just before the actual price bottom occurred on December 24, 2018. Our research continues to suggest that Gold and Silver will rotate within a fairly narrow range over the next 3~5 weeks before setting up a likely price bottom near April 21, 2019. We've been predicting this bottom formation for many months and have been warning our followers to prepare for this move and grab opportunities below $1300 when they set up. 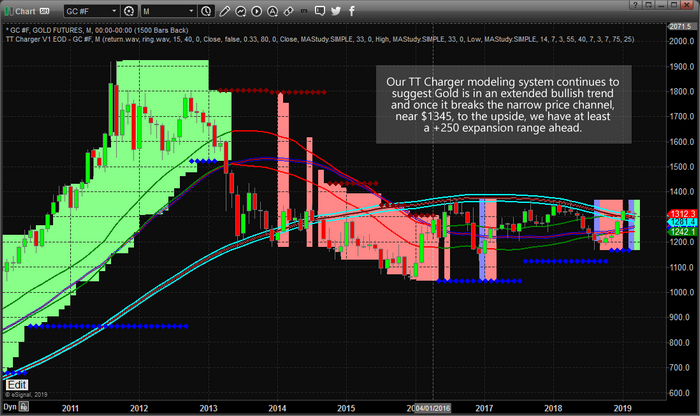 This first chart, a Monthly chart showing our TT Charger price modeling system, clearly illustrates the strength of this bullish price trend and the initiation of this trend back in early 2016. One of the strengths of the TT Charger modeling system is that it establishes a number of key price data points and trend factors. The background color highlighted ranges show price range breadth and range expansion or contraction. The dual channel facets show where price is likely to find support and resistance. The DOT LEVELS show where critical support or resistance is in terms of the overall trend channels. Right now, we are still in a bullish trend with key support near $1165. The Dual Channel system is showing the $1260 to $1285 level is currently the most likely active support levels just below current price. Thus, we could see a move to near these levels over the next 3+ weeks and I would suggest skilled traders jump on this opportunity. The Range system is showing a current $250~350 price range, thus, any upside price breakout could easily rally within this range and push prices at least $250+ higher than current levels – likely well above $1550. If range expansion sets up, we could see prices well above $1750. We've authored hundreds of research posts over the past 12+ months and the one thing that we continue to mention is that Fibonacci price theory continues to operate on the premise that “price must always attempt to find and establish new price highs or lows – at all times”. Please keep this in mind as we continue. After rallying in early 2016 to establish a price high of $1377.50, gold immediately rotated downward to establish a higher low near $1124.50. The $1377.50 high price was a “new price high” in terms of previous rotational highs while the $1124.50 low was a higher low price rotation point. Thus, a failed “new price low”. Since these two price points, Gold has settled into a sideways price channel where new price highs and lows have been attempted, but have failed to breakout out of the existing previous high and low price levels. As a technician of price, we can immediately identify this as a possible “Pennant or Flag” formation. With the last “new price level” being a “new price high” we still believe that Gold will attempt to break above the recent high price levels and attempt a much bigger upside price swing. Our analysis suggests the April 21 date as a critical date for the potential price bottom in Gold and Silver. Our belief is that this date will like result in a near-term momentum bottom in price. Where price may fall, briefly, below $1290 and rotate into a “washout low” price rotation. The opportunity for this move could come 3~5 days before or after the April 21 date. 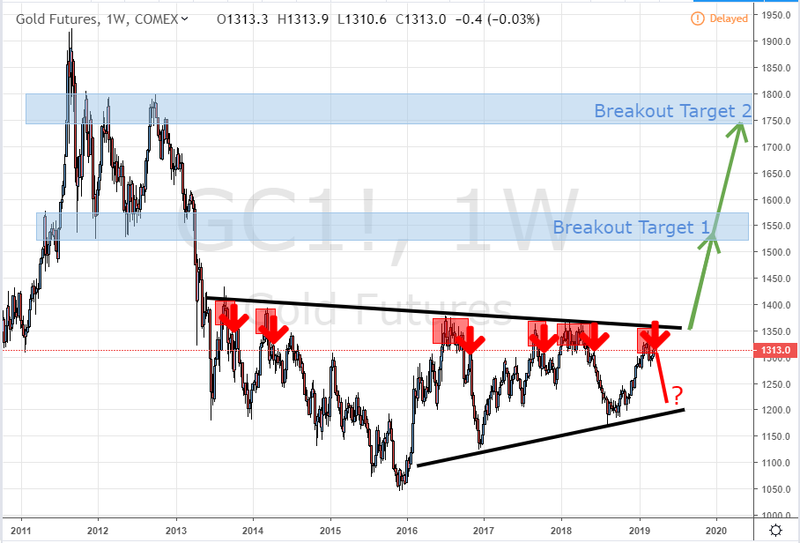 This last chart, a Monthly price chart, illustrating the Pennant/Flag formation in Gold should be the clearest example we can provide that Gold will soon break out to the upside and rally extensively higher if our research and analysis are correct. The momentum that has built up over the past 2+ years, as well as the global demand for Gold by central banks and by investors as a hedging instrument, could prompt Gold and Silver to rally at least 50~60% in this first upside breakout wave – resulting in $1900 gold prices. Silver could rally to well above $18~19 in a similar move and the number our researchers believe may become the upside target in Silver is $21. This big picture chart and technical pattern could still take months to unfold if the price is to test the lower end of the trading range at $1225. If our analysis is correct, Gold and Silver could begin an upside price breakout shortly after April 21 (very likely to become evident in early May 2019). The upside potential for this move is at least $1550 in Gold and at least $18 in Silver. Please understand that any upside breakout in Gold and Silver will likely be associated with general global market weakness including the potential for some type of global crisis event. This could be related to the EU, BREXIT, China, France or any other nation burdened by debt, dealing with election turmoil or related to social or economic angst. We could almost throw a dart at a map of the globe and hit some area that is poised for some type of economic crisis. Our last buy signal for gold and gold miners was in Sept 2018 and subscribers and our team profited from that $100 gold rally. This next opportunity here is to understand that we only have about 20~25 days to search out and isolate the best entry prices we can find in Gold and Silver before our April 21 momentum bottom date hits. This means we need to prepare for this upside breakout move in Precious Metals and prepare our other open positions for the possibility of extended downside pricing concerns. If you read our continued research posts, you'll understand that we believe the US stock market will rotate a bit lower prior to this April 21 date and rally as well. We believe the US equities markets will become a safe-haven, like Gold, where foreign investors can balance the strength of the US Dollar with the strong US economy and continued equity price appreciation while more fragile nations deal with economic crisis events and debt concerns. Thus, we believe capital will flood the US markets after April 21 as evidence of these economic concerns drives foreign investors into US equities. Take a minute to find out why Technical Traders Ltd. is quickly becoming one of the best research and trading services you can find anywhere on the planet. We are about to launch a new technology product to assist our members and we continue to deliver incredible research posts, like this one, where we can highlight our proprietary price modeling systems and adaptive learning solutions. If you want to stay ahead of these markets moves and find greater success in 2019 and beyond Join Our Wealth Trading Newsletter Today. We’re Ready to Profit in the Coming Correction—Are You? Will This Rally End In Tears?